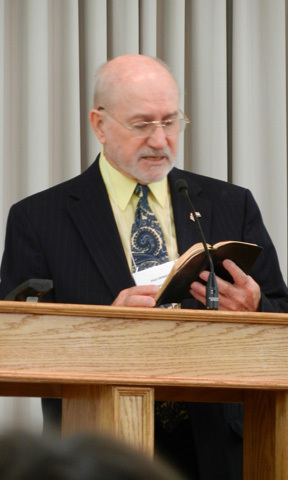 Sunday, April 28, I resumed my weekend speaking appointments. Because Bonnie had felt so poorly on Saturday, and because I was going to be out from early in the morning until late at night, Bonnie opted not to travel with me to my appointments. Sunday morning I was to fill-in for brother Gary Hampton who was absent from the pulpit at the Siwell Rd. Church of Christ in Jackson, MS. This necessitated me leaving Winona, MS at 7:30 a.m. to arrive in time for the church’s Bible class at 9:30 a.m. During the worship, I preached Why Do the Churches of Christ Not Use Instrumental Music in Worship? 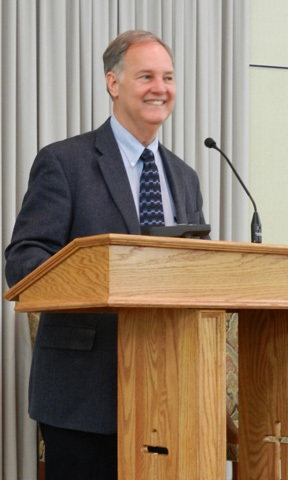 Sermons are streamed live to the Internet as well as archived. 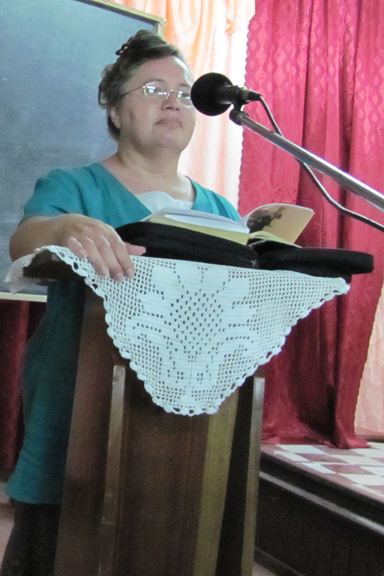 You may view my sermon yesterday or find other lessons at: http://www.siwellroad.com/. Bonnie and Rebecca were present in a sense as they viewed the services from the ease of our living room.Before and after Bible class and worship, many Siwell members sent well wishes through me back to Bonnie. In my absence from Bonnie’s side, members of the Old Union Church of Christ visited her in the afternoon with a basket of goodies. We are so blessed for the encouragement of so many Christian brethren stateside and abroad. Following worship, brother W.E. Walker, who is the deacon over missions at Siwell, took me to lunch at a Chinese restaurant in Clinton, MS. Afterward, we retired for a while to his home. 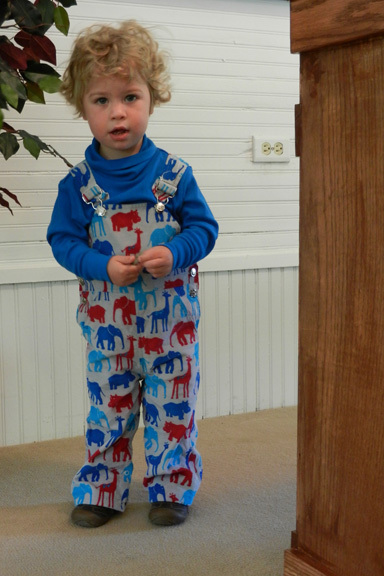 It was then that I showed him a PowerPoint presentation of my recent, 3-week mission trip to Guyana, South America. Around 2:30 p.m., I left brother Walker and proceeded to Best Buy in Jackson to pick up an external hard drive for sister Betty Choate’s office in her home. Actually, I am going to copy several gigabytes from her old computer at the office building to preserve the files and make them available more easily for use in her office in the home. Having done that, next I pointed the van toward my evening appointment with the Union, MS Church of Christ (not to be confused with the Old Union Church of Christ in Carroll County, MS), about an hour and a half away. I was greeted so warmly by virtually every member in attendance that night. Of course, again well wishes were sent to Bonnie through me. The occasion for my presence was to update the congregation about my February mission trip to Guyana. I showed the PowerPoint presentation I had made specifically regarding that trip. After services, I headed toward home, stopping briefly in Philadelphia, MS to grab a sandwich for supper. I pulled into the driveway back in Winona at 10:00 p.m. I was tired, and I know my driving was getting a little sloppy; I’m glad the trip was neither any longer nor any later. It was a lonely ride without Bonnie, a loneliness traveling about with which I have been mostly unacquainted for decades. It is always a good thing to have my best friend, dear wife and coworker accompany me daily and in all things. I had made a humongous, awkward “figure 8” in my travels, but I was back home. Hopefully, I glorified God and edified those before whom I stood on that day. Tags: 2013 Guyana Mission Trip, Why Do the Churches of Christ Not Use Instrumental Music in Worship? Thursday, Bonnie and I ate lunch at the local Mexican restaurant with sister Martha and brother Bob Noland, who had come down from Ohio for a week and a half to help take care of Bonnie after her return home from the hospital. The occasion was because the Nolands were returning toward home Friday morning, and Martha twice mentioned that restaurant. We also invited and were joined for lunch by sister Betty Choate and sister Barbara Wright. Friday, I took Bonnie to the office for half a day. She used the stair, chairlift to make her way to the second story offices. She noted that it was unfortunate that the chairlift concluded its ride at the opposite end of the building from where her office is, so she had to walk a greater distance than she preferred at this time. Bonnie worked on printing the numerous “Thank You” cards that we send for each monetary gift toward our missionary labors. We divide the workload; she makes the personalized cards, and I print the envelopes, stuff and stamp them. We had lunch at the office and then returned home for her to rest. I mowed grass and changed oil, etc. on two lawnmowers. Saturday, Bonnie felt poorly all day, and she rested, alternating between bed and recliner. I bought her some medicine and medical supplies, went to the office to finish processing the “Thank You” cards she had prepared the day before, mailed them and got one of the few “professional” haircuts that I have had in decades (since Bonnie usually cuts my hair) and rehearsed my lessons for my Sunday appointments. The paragraphs may be short, but the activity therein has a way of filling the days, especially for Bonnie, but as well for me at her side. Our daughter Rebecca came down on Friday evening after teaching all day; she is a great encouragement and help, particularly at this time. The surgeon and his nurse closed up the abscess in her suture with adhesive strips and removed all but four staples – two on either side of the abscess. He attempted to remove the two remaining tubes protruding out of Bonnie’s abdomen, but the internal stitches had not dissolved yet. Bonnie quickly changed her mind as to whether she wanted those tubes removed today or at some future time. Pain will do that – change one’s mind on something of that nature. On Tuesday, May 7, Bonnie has her first official visit with the oncologist in the morning, and in the afternoon, she will see the surgeon once more. Whenever the chemotherapy begins, the surgeon will install a port to accommodate the IV infusions. Following the appointment today, we ate with the Nolands at a steakhouse. Each couple shared a meal. I got more than half, as Bonnie can eat but a little yet. Next, we took Martha to brother Dulaney’s office for him to check out her toothache. He was able to determine that she had an infection, and Dr. Dulaney prescribed an antibiotic – for which she is thankful. On the way home to Winona, we stopped in Madison, MS at Wal-Mart for groceries. Bonnie braved going inside, but not finding a motorized cart available, she proceeded to walk behind a cart – which she came to regret. Whenever we leave town, it pretty much takes up an entire day, and this was no exception. Bonnie returned home exhausted, but we think that she will be able to start going on at least short trips, such as Wednesday evening Bible class at the West President St. Church of Christ in Greenwood, MS. Phone calls, texts, cards and visits continue to encourage us as Bonnie recovers from surgery and faces chemotherapy soon. Thank you for your prayers, too. This Sunday, I will resume my Sunday speaking appointments to report on our mission work. Our next scheduled trip abroad is in September of this year. Depending on variables such as the completion of chemotherapy, Bonnie may or may not be able to travel overseas at that time. If she cannot, as long as she is stable and reasonably healthy, I will keep those appointments with brethren in Asia. 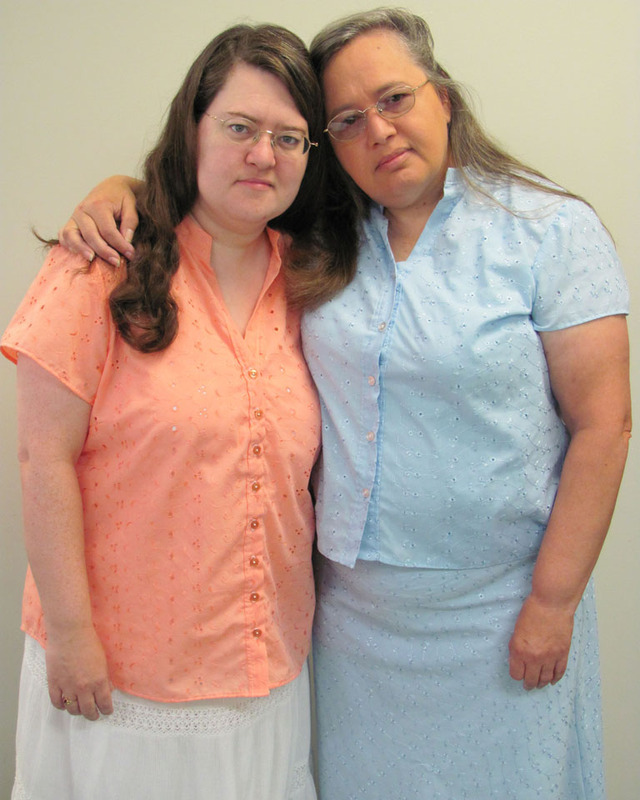 Both doctors anticipate that Bonnie will be able to keep her ladies’ retreat speaking appointment in November, and both think that she should be able to travel to Guyana, South America and participate in that labor in February of 2014. Do not count us out; we are not done yet. We have work for the Lord left to do – stateside and overseas! I had no preaching appointments today, but I stayed close to home for worship. In the morning, Rebecca kept Bonnie company while Bob and Martha Noland and I attended Bible class and worship at the Old Union Church of Christ. This little, vibrant congregation in the woods of Carroll County, Mississippi is a spiritual and emotional crutch to Bonnie and me in our health crisis. Not only is this little church one of our supporters in mission work, but through its members it has carried us along in these difficult times. The first person to mount the podium platform was this little fellar – though he was soon retrieved and was not permitted to address the assembly. 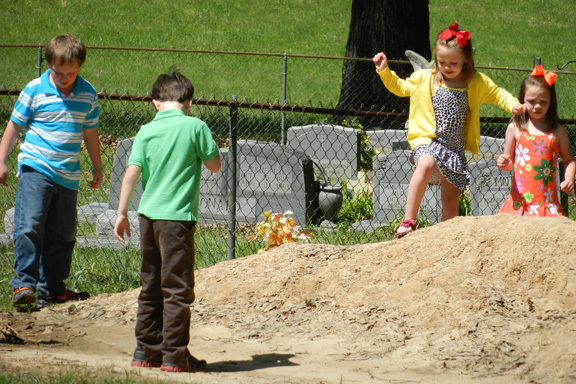 All ages were represented, and a few of the younger ones were drawn naturally to the dirt pile between class and worship as well as after worship. The setting was perfect! Nestled deep down winding and hilly gravel roads, adorned with forest and kudzu, the white framed church building sits in a clearing and is accented with a manicured cemetery around it. There is something peaceful amidst nature with its quietness except for the sounds of God’s creatures and God’s people singing hymns in adoration of His name. Sunday evening, Martha remained at Bonnie’s side as Bob and I worshipped with the Elliott Church of Christ. Rebecca had returned home to Collierville so she can teach school tomorrow. A small group of Christians cordially greeted us and sent with us their encouragement for Bonnie as well. Next week, irrespective of whether Bonnie is ready to travel yet, at least I will resume Sunday preaching appointments. In the morning I will be with the Siwell Rd. Church of Christ in Jackson, MS. That evening, I will be with the Union, MS Church of Christ (not to be confused with the Old Union Church of Christ outside of Carrollton, MS). Bonnie has an appointment with the surgeon in Jackson, MS on Tuesday. The Nolands return homeward Friday morning. Rebecca will return to us Friday evening. Thank you for your prayers. 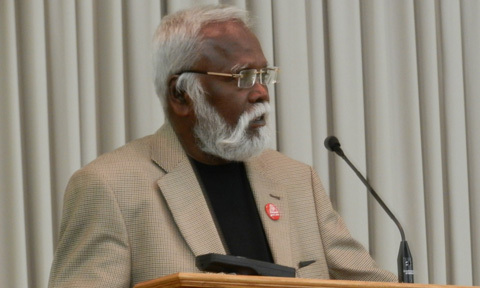 The 2013 India Missions Conference was held at Heritage Christian University in Florence, AL, and it was hosted by the Leoma, TN Church of Christ. Sessions ran from Wednesday evening through Friday evening, with day sessions throughout Thursday and Friday. Speakers came from various places stateside as well as from India. The program consisted of field reports, assigned lectures, singing and prayer. Of course, we ate together often – supper on Wednesday through Friday and lunches, too, Thursday and Friday. Willie Hamblen was the master of ceremonies, and speakers included: Charles Scott, Ricky Gootam, Joe Williams, Paul Swindle, Dennis Jones, Robert Morris, Mike Brooks, Louis Rushmore, Ron Clayton, Robert Hall, Peter Solomon, P.J. Joseph, S.M. Vinay Kumar, Damon Vincent, Glenn Buffington, Ben Renegar, Roger Wright, Joe Evans, Wayne Barrier, Jay Dryden, Russell Bell, Rick Johnson, Royce Frederick, Rodney Livingston, Willie Hamblen and Wayne Kilpatrick. Speakers for ladies’ sessions included: Janice Berengar, Carolyn Morris, Susie Frederick, Betty Hamblen, Betty Choate and Janet Barrier. Saturday, Wayne Kilpatrick narrated a Restoration History tour of the area for those who lingered another day for that purpose. 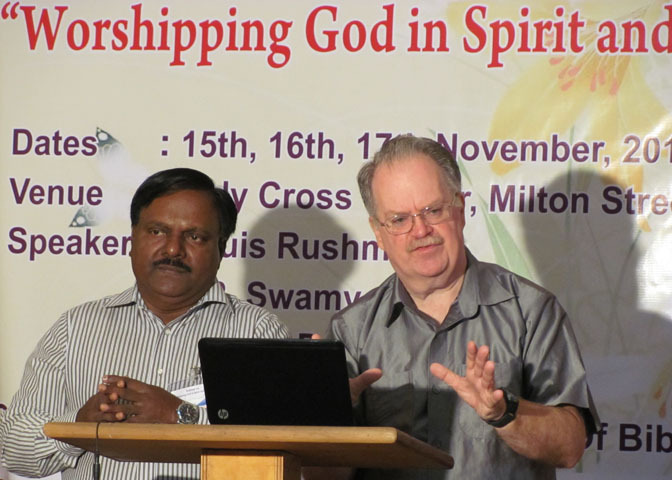 Plans for the 2014 India Missions Conference are for the congregations that voluntarily cooperate in the church program known as World Evangelism to host it. Details will be forthcoming. 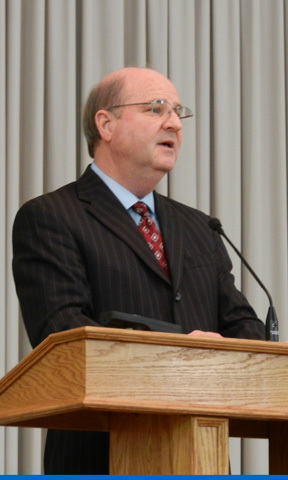 In 2015 Ron Clayton and his sponsoring congregation will host and organize the India Missions Conference. This year, attention turned to maturing the Lord’s church in India. Along the way, brethren going to India with the Gospel of Christ became a little more familiar with each other’s programs of work. I also had opportunity to familiarize some brethren better with The Voice of Truth International, Global Harvest and Gospel Gazette Online magazines. In addition, I reacquainted brethren in attendance with the about 300 titles of books and tracts produced by World Evangelism Literature; approximately 100 titles of books and tracts were on display and available to be purchased at a reduced cost. I also gave away several copies of my book, Beverage Alcohol, too. The overall program was relaxing and informative. It was a time for missionaries to India to share news of their encounters abroad and to recount their accounts of either leading precious souls to Christ or of edifying Christians in India. It was good to be there, and we look forward to the next such program in 2014. Bonnie and I arrived home from the hospital on Monday. The first few days continued to be painful, uncomfortable days with disrupted nights lying on her back. A couple of those days, pains in one of her legs added to her restlessness. Remember that Bonnie was checked for a similar numbing and pain while in the hospital, and blood clots have been ruled out. Thursday night, she slept some better. Her pain is constant in spite of prescription pain medicine, but Bonnie is content with the lower level of pain afforded by taking her medicine. She is reluctant to take much pain medicine because she doesn’t like to feel loopy – I’m sure that’s a medical term! Wednesday, Bob Noland and I left town for Florence, AL to attend the India Missions Conference through Friday. Martha Noland remaining behind and caring for Bonnie as tenderly and as thoroughly as would I made it possible for me to keep my speaking appointment at that function in Florence, AL. Friday after work, Rebecca also came down to Winona to spend the weekend with her mother; after the Nolands return home to Ohio, Rebecca will still come down weekends to help me take care of Bonnie and for Rebecca to assist Bonnie when I travel to weekend appointments with churches. Tuesday of the coming week, Bonnie has an appointment with the surgeon in Jackson, MS. Two weeks after that, Bonnie has her first official appointment with her oncologist (the oncologist did stop by Bonnie’s hospital room once). We continue to appreciate all the encouragement, moral support and well-wishing received from Christian friends near and far. Every time someone knocked and came into the hospital room, Bonnie and I hoped it would be Dr. Copeland, and we further hoped that he would discharge Bonnie. Finally, he indeed was the one entering, and he did relent to permit Bonnie to return home today. An hour and a half later, after we signed discharge papers, Bonnie had bandages replaced, the PICC Line was removed and we both had our respective lunches, we left the hospital and headed for our Winona home. 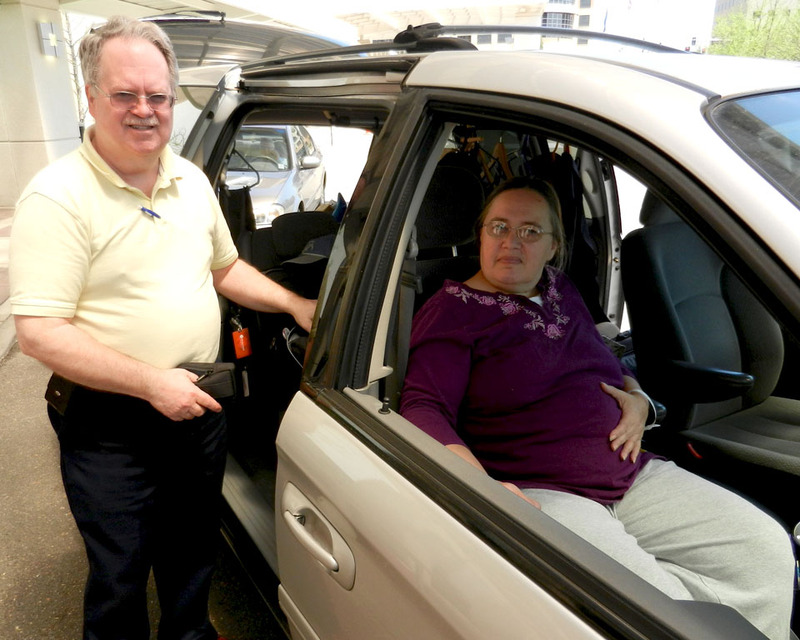 With impeccable timing, brother Chris and sister Valerie Bates arrived to visit us in the hospital room – perfect timing for helping us cart everything to the car. We traveled to Jackson, MS on April 3rd in preparation for Bonnie’s operation on the 4th of April, and so we camped out in one part or another of the hospital for nearly two weeks. In that time, we had accumulated stuff – both what we (mostly I) carried into the room and what the hospital contributed to our campout. Earlier in the morning, we were delighted to be visited by brother Gary and sister Teresa Hampton. 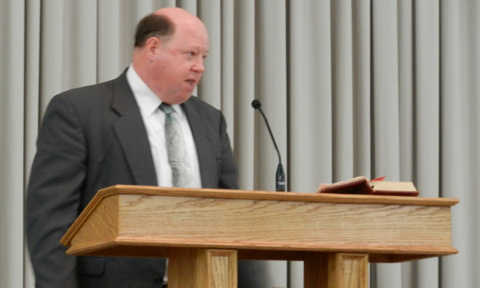 Brother Bates is one of the elders of the Siwell Road Church of Christ, and brother Hampton preaches for the same congregation. Bonnie and I arrived back in Winona at 3 p.m. CST. Our guests brother Robert and sister Martha Noland from Ohio are scheduled to arrive about 7 p.m., and Martha will help tend to Bonnie for the next week or so. We are so blessed by overtures from far and near, ranging from well wishes to others also volunteering to come literally to us and help out. May they all and we too magnify the name of Almighty God not only in the Christianity we profess but by the Christianity we act out. Thank you one and all. The weeks immediately ahead of us will see Bonnie recover more fully from the surgery and meet appointments with the surgeon and the oncologist prior to the beginning of chemotherapy. As we understand it presently, Bonnie will undergo chemotherapy for six months. One day each week for three weeks we will go to Jackson, MS for Bonnie to receive an one-hour IV infusion. The next week there will be no therapy. This cycle will continue for six months. We covet your ongoing interest and prayers. In the meantime, we long to resume service to our Lord, and we will do that immediately. Bonnie will start slowly with moments of computer work on her laptop while in the living room on the reclining loveseat. I have two speaking appointments this week at the India Missions Conference in Florence, AL, and I will resume Sunday appointments stateside without being accompanied by Bonnie. The work goes on as long as and to what extent we can until our bodies are worn out or we pass from this temporary existence. We pray for strength. Comments: Comments Off on Home!